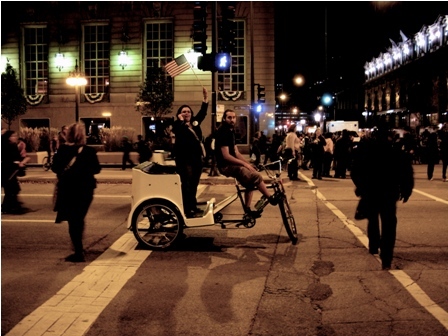 CHICAGO – Jeff Deutchman’s “11/4/08” is a documentary like no other. 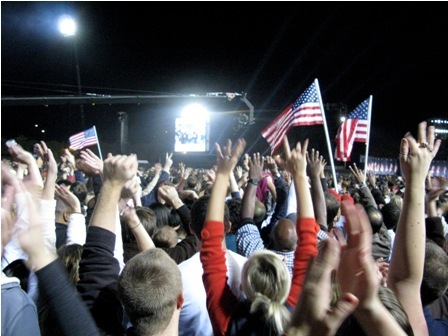 It centers on the historic Election Day of 2008 that named Barack Obama as the next American president. Deutchman called on his friends, including Joe Swanberg (“Hannah Takes the Stairs”) and Henry Joost (“Catfish”), to capture footage from the day both nationally and internationally, from Manhattan to Dubai. As a self-proclaimed “piece of consensual cinema,” the film invites viewers to literally participate in the experience, submitting their own footage via the website 11-4-08.com. HollywoodChicago.com interviewed Deutchman a day before his film’s nationwide theatrical premiere. HollywoodChicago.com: How did this project initially come about? Deutchman: Just like a lot of people, I was getting swept up in election fever at that time in 2008. About two weeks beforehand, after I had already done some volunteering, donating and all the other stuff, I started to think about how I might be able to contribute in a way that came more from my own knowledge and experience base, which is in film. So my interest in it initially was really out of an earnest place, coming from my interest in the election and in Obama. But [the project] morphed over time, and my interest began to encompass a lot of things. I really became interested in the experimental angle of it. If this is going to be a historic day, what does history look like when captured on camera, especially if you’re able to utilize all the technological advancements that we’ve gone through, both in terms of digital cameras and the web, and the connectivity of social networking? So I really wanted to experiment and find out whether history can be captured using all of this available technology. 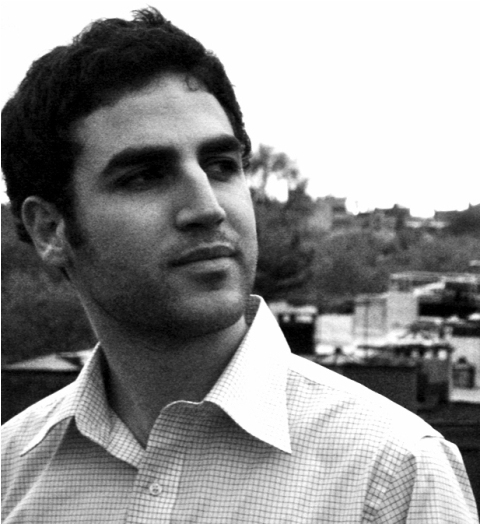 Filmmaker Jeff Deutchman aims to capture history in his documentary 11/4/08. HollywoodChicago.com: You’ve cited Frederick Wiseman as one of your artistic inspirations. For this project, how did you manage to maintain a Wiseman-like objectivity while in the editing room? Deutchman: One of the things that comes up a lot is the fact that the vast majority of footage I received came from Obama supporters. A lot of what you see in the film is depicting the Obama side, which makes sense because if you think about it, the people who are most likely to be filming on that day are probably the people who are having fun and celebrating. Just because it focuses on that side didn’t necessarily mean that what you’re looking at is something that is wholeheartedly endorsed or condemned one way or the other by the film. My objective was to look at what was going on, to observe it. And yes, Wiseman is obviously the godfather of the observational approach. HollywoodChicago.com: Do you feel that the accessibility of filmmaking equipment to the current generation will enable history to be logged unlike ever before? Deutchman: I think there are two questions: one has to do with art and the other has to do with history. When it comes to art, I think it’s less certain what can be achieved with these tools. Just because everyone has access to these [tools] doesn’t mean everyone knows how to use them. I do think that digital cameras are being used in very artful ways, but not everyone is Lars von Trier. However, when it comes to writing your own history and using cameras and the web not to become an artist per se but to become your own historian—sort of picking up where Howard Zinn left off and replacing him with the people themselves writing their own history—that’s where I think this technology is really exciting. HollywoodChicago.com: As curator, how did you go about choosing this particular group of filmmakers, including such accomplished figures as Swanberg, Joost and Margaret Brown? Deutchman: You know, to be completely honest, it was all happenstance. It really had to do with who was in my rolodex. I sent out e-mails and Facebook messages to pretty much everyone I knew, which included them, and I was very lucky that they decided to participate, [since] they are very talented filmmakers in their own right. But it was a mix of professionals like them and amateurs who don’t work in film. My objective was to cast as wide a net as possible because I felt like this experiment could only really work if I got as many people, perspectives and geographic spots as possible to paint as complete a portrait as you can do. Now obviously, the film is limited in that regard because my reach is limited. I didn’t get footage from every single country, and I mainly got footage from the Obama side, which is why I started 11-4-08.com. The [site] is continuing to collect footage and hopefully that’s where we’ll get to see a diverse portrait of the day come about. HollywoodChicago.com: “11/4/08” ends with a title card declaring that the picture is incomplete. Do you consider this film to be a work in progress? Deutchman: Yes and no. On the one hand, I’m very happy with the film as it stands because I think that the film is one thing. I took the footage that I initially collected, I observed patterns that existed within it, and I decided that there were certain themes that I was interested in and I used it to make my version of that day. Now, in terms of the website, who knows? Maybe in six years I’ll pull a Michael Apted and decide to re-edit it and do something new with it. But much more exciting than that possibility, in my opinion, is the idea that there is this website where you can find footage from any country on that day and download it. You could literally download all of the same footage that I have and create your own version of that movie. So it’s open for people to do that and my hope is that it will give rise to a whole bunch of new projects, and become basically an interactive history textbook. HollywoodChicago.com: What inspired you to repeatedly utilize the percussive music performed by a man in the subway? Deutchman: It’s interesting that you bring that up because that’s probably the only music in the film. My one rule about this project was that everything had to have been shot within “your waking hours of 11-4-08,” so for me, audio is included in that. To suddenly put some non-diegetic soundtrack on it would’ve felt like a violation to me, and the same goes for news footage or anything like that. It had to have existed within the frame. So this was my one opportunity, because it was basically me shooting. I was in New York, and I happened to talk to this gentleman who was playing the drums in the subway. He started talking to me and playing the drums, and it actually works nicely because it was the one piece of music that I allowed myself to use in the film. HollywoodChicago.com: The chilling question this film asks is whether we are observing real change or the construct of change. I’m curious about your own thoughts, and whether you think it’s a mixture of the two. Deutchman: Absolutely. It’s not that I’m afraid to step out of my objectivity, which I think is a bit of a myth. I think it’s more just that the answer is constantly changing, and it depends on the latest thing that the Obama administration has passed or not passed. That ultimately is an ever-changing question, but I think even beyond the specifics, there is this larger question of, ‘Maybe that’s what historic moments essentially are.’ They are moments where we allow ourselves to get swept up in something and briefly become idealistic. I do believe it was inevitable that the expectations could not have been met. So for me, what’s interesting is that essential quality about time passing and how it has an effect on historic moments. Deutchman: I liked that question, because I think it cuts to the heart of what’s going on. It’s always very difficult to sum up your political ideology in a soundbite, but I think that question allows people to think about, ‘Well, how is my life going to be changed by this? Is it at all?’ The last thing I want to do is cast doubt on whether people should be participating in democracy and voting because obviously I’m a huge proponent of that. But in a more philosophical sense, I think it is very difficult to see real change in your life, not even just in terms of politics. You have to take a very macro perspective on things to really see change and part of the idea of this movie was to take a micro perspective, look at it up close and see if you can actually see change happening. Deutchman: I like that movie, but yeah, I always thought it was funny because of the title. [Laughs]. In a way, I guess it applies to my film. … I heard about that film after I had already started working on mine, and it was very late in my own editing process when the movie came out at the Sunshine in New York. I think it might’ve been when I finished my first cut of the film. I snuck out of the editing room to see “By the People” because I was just so curious to see what someone else was going to do with a doc. I don’t think they’re very similar, but obviously it has some kind of kinship. I remember feeling relieved to some degree when I saw it, because I was like, “Well, this is just a different kind of filmmaking.” I was kind of worried that there was a chance that the film could overshadow me, but the truth is, it’s just a different film. 11/4/08 premieres on VOD via iTunes, AmazonVOD, Sony Playstation and CinemaNow on Oct. 22. HollywoodChicago.com: To what extent were you involved in the itineraries of each participating filmmaker on production day? Deutchman: It was really loose. Basically once I had sent out the initial feeler and I got a response from maybe something like fifty people who were interested, there was no reason for me to get too involved because they were all using their own equipment. From my point of view, the more footage, the merrier. I just wanted to encourage people to shoot. So once I got those fifty people who were interested, I sent out a pep talk e-mail that told them the one rule of shooting only within their waking hours of 11/4/08. I think I sketched out some ideas of what I was looking for, saying that I preferred the observational approach, but I didn’t want to alienate anyone. I really wanted to cast a wide net, so I kind of let people make their own judgment calls. I also gave everyone a release form, and told people to try to get releases signed whenever possible. Some people did that, and some people didn’t. I had to go back and track people down. [Laughs] This kind of filmmaking comes with its own set of hazards. … At the very end [of the film], all of the people whose names I know are listed in the “Featuring” section of the credits. There are a few people I shot who did sign something, but I just haven’t been able to find them since that day. For example, the felon who I interviewed in Harlem, his name is Alance Peterson, and he’s one of my favorite people in the movie. I’d love for him to see it, but I just can’t find him. HollywoodChicago.com: As Acquisitions Manager for IFC Films, what are your views on online distribution as a viable alternative for finding a wide audience? Deutchman: Well, I guess there are a couple ways to look at it. Basically, I believe in options. I think consumers are all different. Some of them prefer to see their movies in the traditional way on the big screen, and some of them prefer convenience, and some of them prefer the big screen, but practically, just can’t make it happen all the time. So, I believe in options, but I think the other thing is, you have to tailor a distribution strategy to a particular film. Just like how there are all different kinds of consumers, there are all different kinds of films. Because my film has a website that is a huge part of the project, I think online distribution makes a lot of sense. People can watch the movie, then click and they’re right on the website. The other aspect, financially speaking, is to see what happens as the Internet becomes more well-monetized. I hope that it becomes more viable for independent filmmakers to actually be able to make a living. HollywoodChicago.com: The vast majority of the country has no other option of how to view these independent films during their initial run. Deutchman: Yeah that’s the thing. Traditional theatrical releases are too expensive, and a lot of cinephiles who don’t live in major cities were being under-served. It’s just too expensive to bring a particular film to their town because there are fewer cinephiles there, but that doesn’t mean they don’t exist. So you got to bring it to them somehow, and I think that bringing it through VOD [Video On Demand] is a very viable option. HollywoodChicago.com: Moviegoers will be able to tweet questions to you during a streaming Q&A following the film’s theatrical screening on Oct. 20. Have there been many other independent film screening events quite like this? Deutchman: I think that there are elements of this that have been done before. Emerging Cinemas, which is the network that’s responsible for a large amount of theaters that are playing the film tomorrow, has done this kind of thing before with films, in terms of the live streaming Q&A. IFC, for example, has done releases that are day and date with film festivals on VOD. I tried to combine all of these elements. I wanted the film to come out right before the midterm elections because I think there’s an obvious interest at that point. I happened to notice that there were a bunch of film festivals that all coincided in the middle of October, and one of the things that we’re constantly talking about in the indie world is increasingly how, for these smaller films, the film festivals are becoming the theatrical release itself. So I thought, yeah, if I want my movie to be seen in multiple cities on the big screen, why not just use the festivals that are happening at that time? I had to cherry pick certain things happening in certain cities, but as a whole, it sort of comprises a really significant theatrical release. It’s about twenty cities. 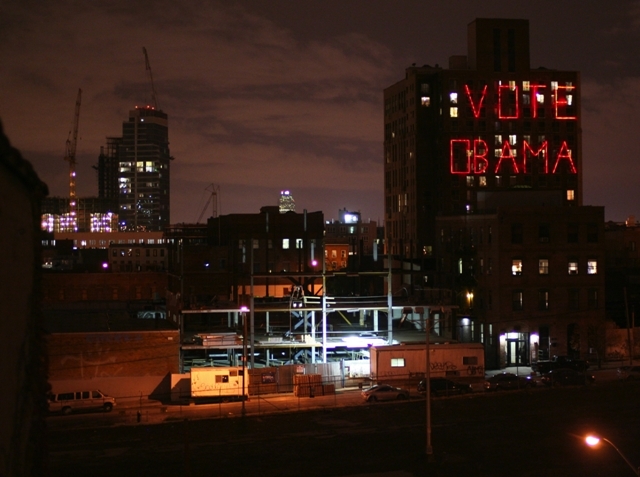 ‘11/4/08’ will screen simultaneously in cities around the country, including Chicago, on Oct. 20, 2010. The 6pm screening is free, and will be held at the AMC River East as part of the Chicago International Film Festival. The film will be released on VOD via iTunes, AmazonVOD, Sony Playstation and CinemaNow on Oct. 22. It is edited and curated by Jeff Deutchman.